Alternative Turkmenistan News is launching a series of publications about Turkmen citizens who have been denied the right to leave their home country. 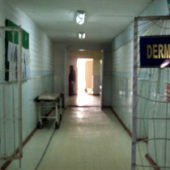 In most cases, exit bans are imposed on the basis of the alleged violations of foreign countries’ laws (Item 9, Article 30 of the Law on Migration). Travel restrictions usually affect individuals who had worked in Turkey without official job permits. 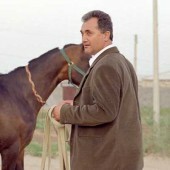 Among people who are not allowed to leave the country are also relatives of those who took part in the alleged coup attempt against former president Saparmurat Niyazov in November 2002, families of opposition members living abroad, civil activists, students of certain higher education institutions, and journalists. Human rights advocates estimate that up to 17,000 individuals are listed in the ban register. New names are regularly added to the register, with some people discovering they have been blacklisted only during passport control at the airport migration service. For them, it is just a start of an exhausting ordeal of trying to find out why they had been banned, and how to get their names off the stop-list. 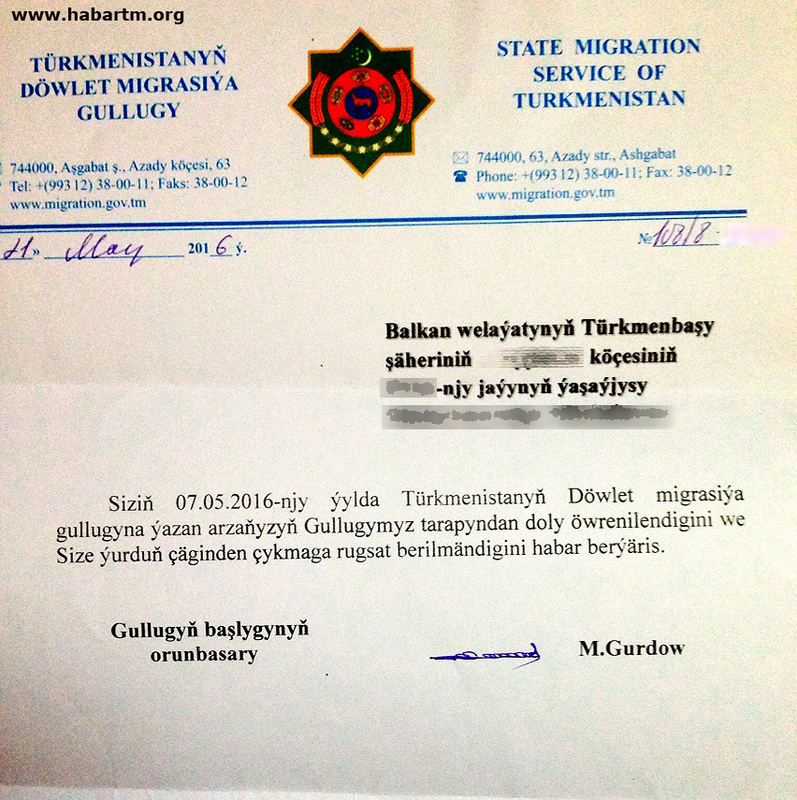 Oksana submitted an official inquiry to the State Migration Service, and learned from their response that that she was banned from leaving Turkmenistan until 2020, as a penalty for breaking the law in the host country. But Oksana had never violated any laws. Nine months before that she had already visited Lebanon with an employment visa and a contract. 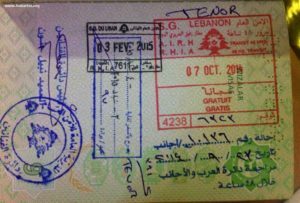 Her Turkmen passport was stamped by the Lebanese immigration authorities, and she had not received any claims of wrongdoing from them. 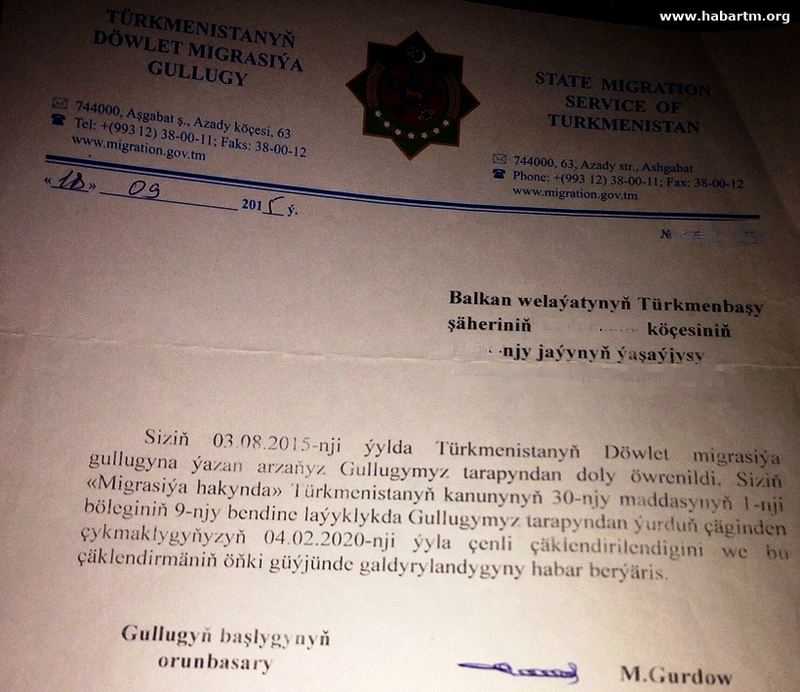 Yet, the migration service in Turkmenistan found the stamp suspicious. 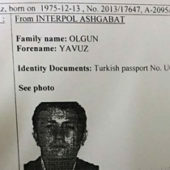 “When I arrived to Ashgabat, a border guard checked my passport and asked if I had been deported. I said I was not. He then pointed to the English word ‘Depart’ in the stamp and ordered me to go to the migration chief’s office for an investigation. Visa stamps in Oksana’s passport. On the black stamp the word ‘Depart’ can be seen. Nine months afterwards, Oksana decided to work in Lebanon again and was granted a work visa on the basis of a contract. But she was not allowed to leave the country. 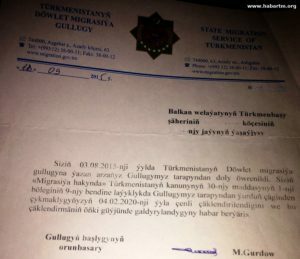 Having written to migration service, she received nine identical replies: exit is prohibited due to violation of foreign country’s laws (ATN has copies of all these letters). 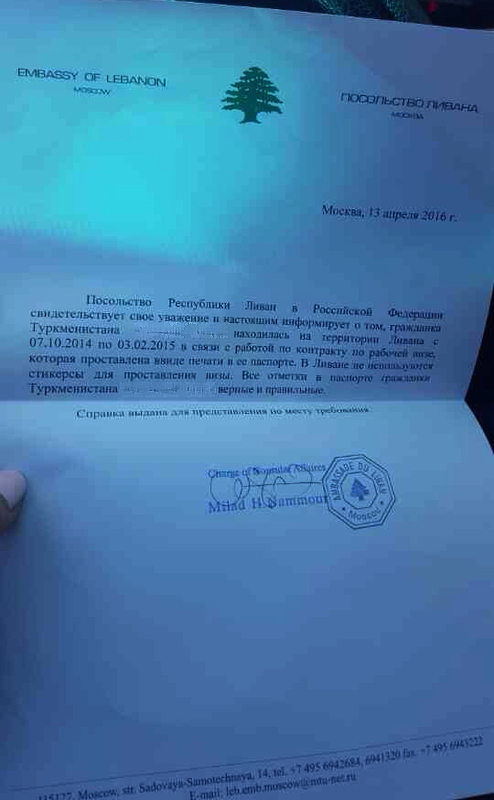 Pursuing her rights, Oksana wrote an appeal to the Embassy of Lebanon in Moscow with a request to confirm that she had not violated any Lebanese laws. 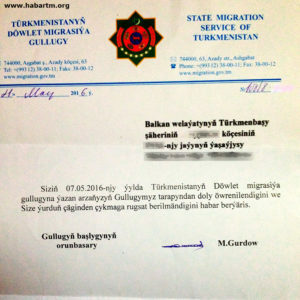 The Embassy affirmed that Oksana, as a citizen of Turkmenistan, was contracted to work in Lebanon and had a legal work visa for the period of her stay. The Embassy’s officer also explained that the consulate uses stamps instead of sticker visas, and confirmed that all the Lebanese stamps in Oksana’s passport were legal and correct. 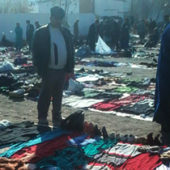 However, the Turkmen migration service did not hurry to acknowledge their mistake, and her ban remained in force. And just like that, because of an illiterate border guard who took “depart” for “deport”, and his supervisor who presumed ballet dancing in an Arabic country meant debauchery and tried to prove it with a vague internet search, a young woman lost her employment opportunity and was banned from leaving her country. “If I were deported, would they have given me a new visa?” – Oksana wonders. 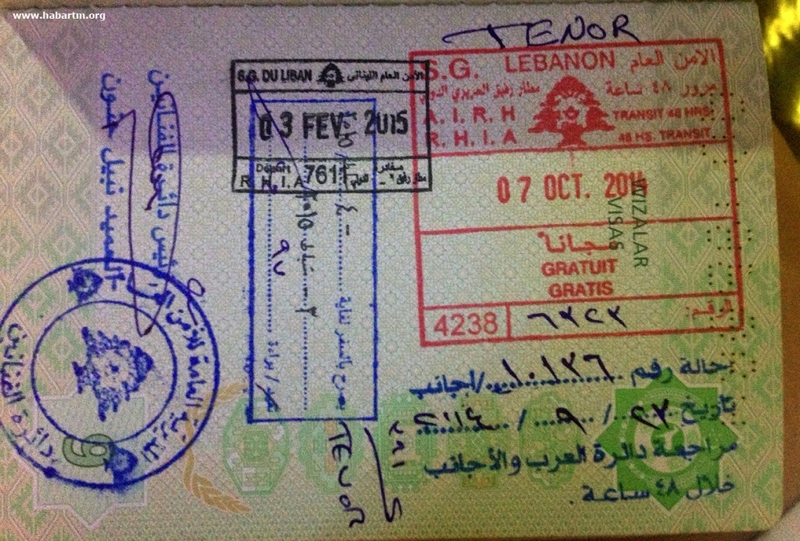 Yet, it seemed that neither common sense, nor the confirming letter from the Embassy of Lebanon helped her story. So Oksana applied to the court, and in May 2016 the Kopetdag district court of Turkmenistan held its hearing on the matter. “It was a circus, not a hearing, – says Oksana. – The session lasted only 15 minutes. There was a prosecutor, a young judge, Ms. Sapargeldiyeva, an ‘international lawyer’ of the migration service, and myself. Before the hearing, the judge and the ‘lawyer’ had a private conversation. At the hearing I learned that our migration service was well aware that I had not broken any laws, and that my exit ban was imposed by a… ‘secret commission’! They could not tell me what kind of commission it was, and why for nine months they kept writing to me that I had violated foreign country’s laws. The ‘international lawyer’ did not acknowledge my request, saying that the migration service was just an executive body, while my exit ban was authorized by a competent body (the so-called ‘secret commission’!) and will therefore remain in force. Naturally, as a representative of a government authority, she received the full support of the court. Moreover, the court confiscated all my correspondence with the migration service and did not even allow me to make a copy. The prosecutor was also a young man who never said a word throughout the proceedings and acted up only when I said that we were the ordinary guest workers, travelling and working for peanuts to feed our children… ‘For peanuts, huh?’ – he was doubtful. I showed him my contract and asked him to extract travel fees and see what would be left. Despite the warning, Oksana is determined to appeal to the higher court and seek the assistance of legal counsel. “It’s not easy to find a job, and as I grow older, it won’t be getting any easier,” – Oksana says. On May, 21 she received another run-around reply from the migration service. This time, it had no reference to any violations of foreign country’s laws. It had no references at all. She just can’t leave the country, and that’s it.